When lifelong resident of Ashton Mike Valente turned 16, he went to the SSVFD to apply to become a volunteer. “I had always wanted to join the fire department and been a strong believer in community involvement. My father was a volunteer at the BCC Rescue Squad, so seeing him serve made me want to give back to the community,” said Valente. In 1981, he became a member of the Hazardous Materials Team, which handles chemical emergencies such as petroleum product spills. Fast-forward 41 years later, he is serving as Secretary Emeritus on the administrative side of the SSVFD after being President for five years as well as Vice President. As Secretary, he maintains all department records, meeting minutes, and membership files. Valente additionally acts as the historian and is third in charge of the entire department. He has served both on the administrative and fire side of the department; Valente worked in every position from Fire Sergeant all the way up to Fire Captain. In April of 1991, he achieved lifetime status after serving for 10 consecutive years. 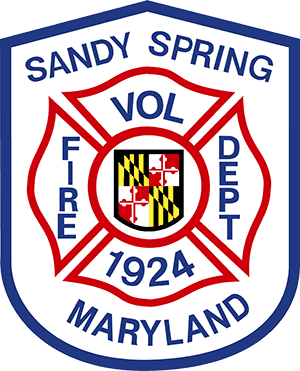 Due to his dedication to serving the local community, Valente was awarded the Sandy Spring Volunteer Fire Department’s highest honor—the Spencer J.H. Brown Sr. Outstanding Service Award—in 1989 and 2001. “The fire department is a big part of my life; I like seeing the results of my work and I’ve been doing it for so long that I can’t imagine doing anything else,” Valente said with a smile.